Don’t you just love Vincent van Gogh? I know I do, and this self-portrait of him was on my ‘create a coloring page wish list’ for a long time. This coloring page is the third in my series of painting coloring pages on LetMeColor.com (in the ‘Misc category’). I hope you’ll like it. Some rights reserved (Creative Commons). This coloring page is created by Frank De Kleine. Original painting by Vincent van Gogh (link to Wikimedia). Here’s the second painting in my new art coloring pages series. This coloring page of Piet Mondrian’s composition with large red plane is iconic. Give it the original colors, or create an original Mondrian with your own favourite colors! Some rights reserved (Creative Commons). This coloring page is created by Frank De Kleine. Original painting by Piet Mondrian (or Piet Mondriaan before 1906) – link to Wikipedia. Do you like art coloring pages or painting coloring pages? 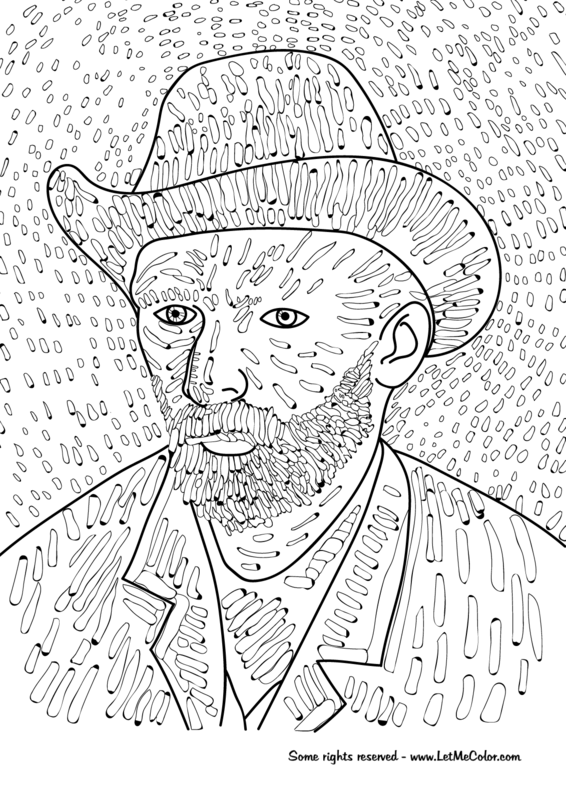 This coloring page of Vincent van Gogh’s famous painting of his friend and postman Joseph Roulin is the first of a new series of painting coloring pages on LetMeColor.com. I hope you enjoy it! Some rights reserved (Creative Commons). This coloring page is created by Frank De Kleine. Original painting by Vincent van Gogh (link to Wikipedia).